My conversation with Sam Calagione. I host a weekly radio show on SiriusXM 111, Business Radio Powered by Wharton, called Work and Life. We publish edited versions of my conversations as free podcasts. I invite you to listen to the episode (embedded below) that is my conversation with Sam Calagione, founder of Dogfish Head Craft Brewery, author of Off-Centered Leadership, and most recently a winner of the prestigious James Beard Award. When Dogfish Head opened in Rehoboth Beach, Delaware in 1995, it was the smallest brewery in America, making only 10 gallon batches of beer at a time. Now, Dogfish is America’s 13th-largest craft brewer and is “the first American craft brewery to focus on culinary-inspired beer recipes outside of traditional beer styles.” Its motto is “Off-centered ales for off-centered people,” reflecting Sam’s embrace of both non-conformity and community. While pursuing a Master’s in English Literature at Columbia University, Sam worked at a Mexican restaurant to pay the bills. However, after trying the exemplary beers on tap at his job, Sam quit school (and his original plan to write a great American novel) and started home-brewing. 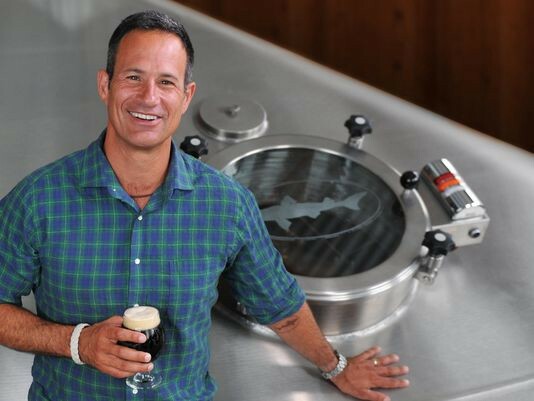 Fast-forward to 1995, when Sam raised $220,000 to open a brewery, and to today: Dogfish Head is a 300+ person company with a seafood-centric restaurant, a beer-themed hotel, and a production brewery in Milton, Delaware. I spoke with Sam about how to apply lessons from Off-Centered Leadership to achieve more satisfaction at work as well as the role creative expression plays in Sam’s work and life. Sam sheds light on his company’s unique culture — including the legendary dropping of “fax machines from the top of our giant treehouse,” tips for hiring for culture fit, embracing non-conformity, establishing partnerships with other niche companies, and more. You can connect with Dogfish by tweeting @dogfishbeer.